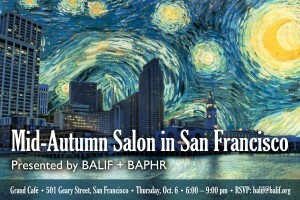 BALIF - Join San Francisco's LGBT lawyers and doctors for an evening of intellectual discourse! Join San Francisco's LGBT lawyers and doctors for an evening of intellectual discourse! Harken back to a time of dynamic dialogue and intellectual opinions. Distinguished ladies and gentlemen discussing the issues of the day. Over glasses of brandy and cognac. Under grand chandeliers. Facing vintage mirrors. Next to a cozy fireplace. The Salon: We take our inspiration from Gertrude Stein and Alice Toklas’s home at 27 Rue de Fleurus in Paris , circa 1934 undefined A fashionable domestic space populated by elegant people discussing contemporary culture and ideas. The crowds were well-read. Opinions about world affairs flowed freely. And the intellectual level of the discussion was rigorous. The French perfected the practice in the late 17th century, and by the mid-18th century, Salons were popular all across Europe . • Event is free for all BALIF and BAPHR members and their guests. Proudly presented by BALIF (Bay Area Lawyers for Individual Freedom) and BAPHR (Bay Area Physicians for Human Rights).